Each year, my school celebrates a special, yet under-acknowledged anniversary in our country’s history. September 14, 1814 was the date when Francis Scott Key wrote the poem that became our National Anthem while witnessing the battle at Fort McHenry. Three years ago, I approached my principal and colleagues with the idea of bringing the tradition of the National Anthem Project to our school. The National Anthem Project is something started by MENC, the Music Educator’s National Convention where their main purpose for this project was to get Americans to know their National Anthem and to get them singing it. For two years, we put on an assembly for our entire Cashman Elementary School community that focused on the history of the song, the four verses of the poem and our singing the Star Spangled Banner. 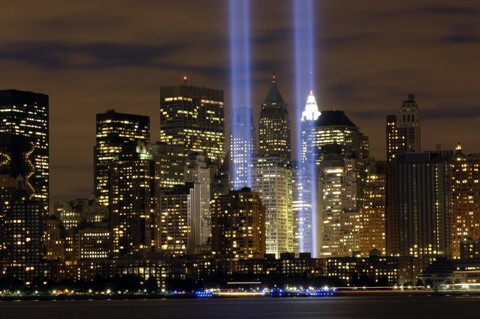 Each year, we always thought about how this event was so close to 9/11, but this year, September brought with it the 10th anniversary so we thought it appropriate to combine the two. To do this appropriately for our elementary audience, we used carefully chosen images, poetry and song opening up with America the Beautiful. Then a line of fourth graders came up to a microphone and took us through the assembly, briefly describing 9/11, sharing a poem about heroes, emphasizing unity among Americans, introducing the National Anthem and then leading the Star Spangled Banner. A view of our 4th grade collage poem commemorating 9/11. To remember 9/11 in an age appropriate way, the fourth grade students created a poem where all 115 students from five 4th grade classes contributed to a collage poem. 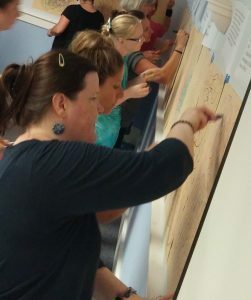 (This idea was learned during the poetry session by Ayanna Gallant during this summer’s Teacher Art Retreat.) After studying an image commemorating 9/11, students wrote down a brainstorm of words that came to their minds and then narrowed it down to two. Then, those words were taken, put together and arranged to create a poem. 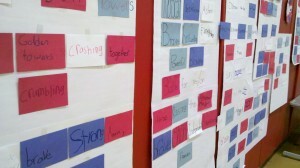 Each class had their own image and their own sets of words, thus creating 5 verses to a poem. This poem was read during the assembly. The students also watched this video that was made by past fourth graders about the story behind the National Anthem before standing tall to sing the song. 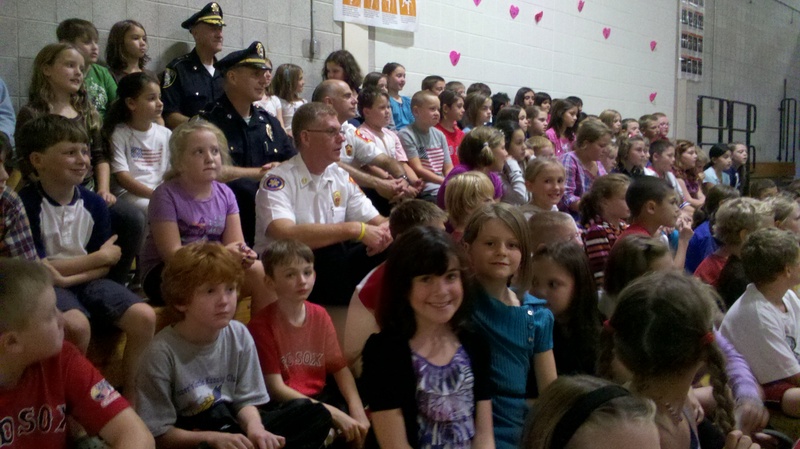 The highlight of the assembly, though, were our honored guests: firemen and policemen from the Amesbury community. When these four gentlemen entered our gym, they were greeted by clapping and cheers. It was wonderful. These community celebrities graciously accepted our invitation to attend our assembly and the kids loved having them. Our guests pose for a picture with our fourth graders after the assembly. It’s important to have these types of serious assemblies for all age levels to instill a sense of patriotism and pride. I’m fortunate to work in a school that honors these times. I wish all a solemn remembrance of 9/11 and send sincere thoughts and prayers to the families of all who have been and still are affected. May God bless America! Here is the poem our fourth grade students created together to remember September 11, 2001. The pictures are the ones that inspired each verse.